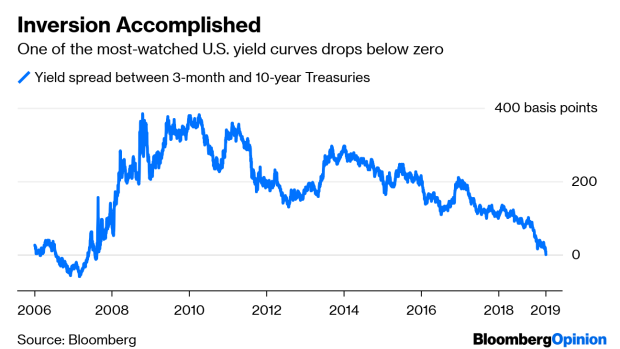 (Bloomberg Opinion) -- What is there to say about the inverted yield curve that hasn’t been said already? The yield spread between three-month and 10-year Treasuries fell below zero on Friday for the first time in more than a decade. It’s arguably the most significant inversion yet because such a move has accurately predicted the past seven recessions. So, yes, it’s true: The world’s biggest bond market is calling for a economic downturn in America’s future. Some caveats before investors sell everything. While this is the first time the curve has been inverted since 2007, during the last cycle, the spread first fell below zero in January 2006, almost two full years before the start of the recession. If history repeats itself, that means traders can pencil in the next slump for late 2020 or early 2021. That’s still a lot of time for riskier assets to outperform, or for the economic outlook to improve. The biggest takeaway for investors from the combination of the Fed’s extended pause, the yield curve’s inversion and the continued weak data coming out of Europe should be that good things must come to an end. The current economic expansion is one of the longest on record, but when strategists use the cliche that the U.S. is in the “eighth or ninth inning” of the current cycle, they probably mean it this time. This is important for those who shrugged off the sharp decline in risk assets at the end of last year and enjoyed the rebound so far in 2019. U.S. junk bonds have already returned 7 percent year-to-date, blowing away just about every Wall Street expectation from early January. The S&P 500 is up about 13 percent. The MSCI Emerging Markets Index is up 11 percent. Seemingly everywhere you look, markets are rising. That can’t go on forever. For the past two years, as I wrote about the yield curve, investors and analysts were quick to point to the all-important three-month, 10-year spread, and they noted it was firmly positive. Indeed, when one portion of the Treasury curve inverted for the first time in early December, the spread was still a lofty 63 basis points, compared with minus 2 basis points now. That sort of reasoning and rationalizing no longer holds water. Again, it’s not time to panic and sell everything. But the winds of change are picking up. And investors would be wise to start making sure they can quickly protect themselves when the inevitable storm comes.